For Heena Rai, April has been something of a whirlwind month with a new job, a 27th birthday and new home all thrown into the mix. And just to give her life added spice - in the process of buying her new Bovis Home in Peterborough she became the first person in the UK to legally complete using the Government-backed 95% NewBuy mortgage product. "I'm in a bit of a daze really. I was really shocked that we managed to get it all done so quickly," she said from her new two-bed apartment. "I still need to get my stuff moved in but I couldn't be happier. "I was done with renting and living with other people and felt it was time to do things on my own and stand on my own two feet. This is my first place and it really feels like a new chapter of my life - it's great to be spending money on my own mortgage rather than someone else's." This first home purchase ensures that 2012 will now always be a milestone year for the designer. She was previously working for the Royal Mint in Llantrisant, just north of Cardiff, and worked on projects promoting this year's Diamond Jubilee and London Olympics. She's now swapped life in Wales to be nearer her family and a new job with Kiddicare, the country's largest retailer of baby products. "It's come out of the blue really. I didn't think I would be able to get into a new home in time for my new job but the Bovis Homes team were really helpful and when I worked through the figures using NewBuy it all added up. "Only needing a 5% deposit made a real difference and the initial monthly payments were manageable - and here I am! The fact that I'm the first person in the country to have a NewBuy mortgage is a bit crazy! "When I was driving around looking at places in the area the development struck me as really nice and the location was perfect - five minutes from work, five minutes from a supermarket and close to the city centre. You have to take that into account when looking at your monthly finances because I'm not spending much on a daily commute. "The new home and the new mortgage have proved to be the perfect package for me." 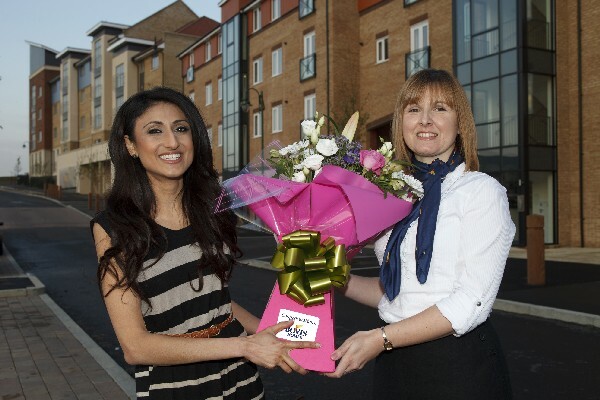 Bovis Homes Central Region Sales Director Alison Tindle is delighted that her team were able to help Heena secure her dream home to fit with her tight schedule. "At Bovis Homes we believe in offering our customers every possible support, both before and after their purchase, and we were delighted to play our part in helping Heena buy her first home to coincide with her new job. We'll continue offering her our help as she settles into her new home. "We're proud at Bovis Homes Central Region to have her on board as the first NewBuy customer in the whole country and I am sure she will realise the benefits of taking up this excellent product. "Higher deposits have hindered first time buyers and movers alike and this new 5% deposit requirement promises to unlock the market for a number of homebuyers." NewBuy provides a homebuying solution which requires just a 5% deposit and is available to both first-time buyers and existing home owners buying new-build properties priced up to £500,000 as their main residence in England. It is being backed by four major high street lenders - Nationwide, Barclays (Woolwich), RBS (NatWest) and Halifax, with more expected to come on board in due course.